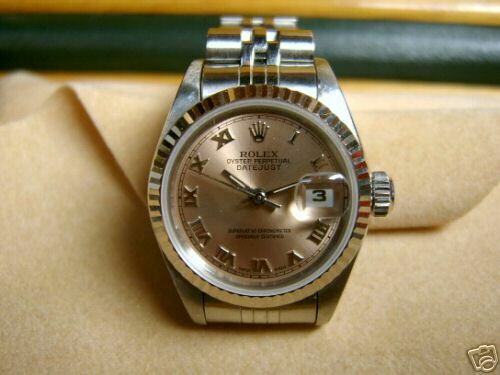 Rare luxury ladies size 29mm with crowns rolex ladies datejust 69174 white gold/ss, beautiful rose roman dial, one owner, reference number S 186572 IN Jan 1995!!! Authentic minty condition 100% rolex datejust ladies as new, jubilee link in good condition!!! it has a very minty original all authentic high grade automatic rolex movement, runs very well, original off white dial in near mint condition, overall in excellent condition, u will be very pleased, all parts original and triple signed, no surprises, no disappointment.